Notice anything different? 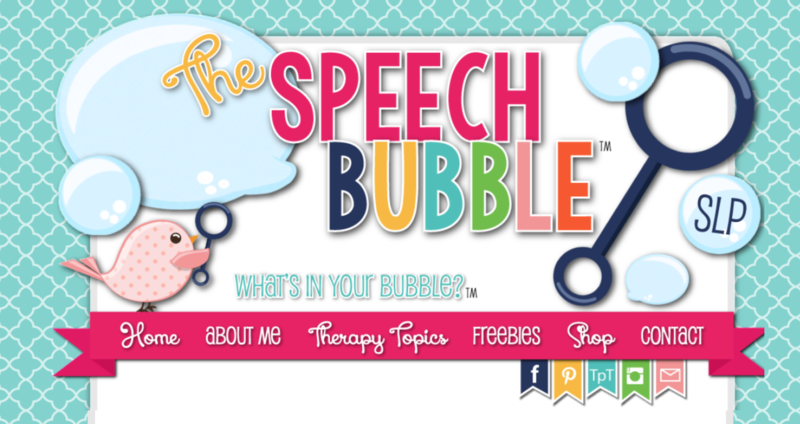 Yup, that’s right, The Speech Bubble SLP got a makeover! It’s not that I didn’t like the old look, I just felt that it was time for a change, an update if you will. Below is a before and after, what do you think? Things are a brighter and more vibrant. Bubbles, aka the cute little bird, got an update too. I rearranged some things too. 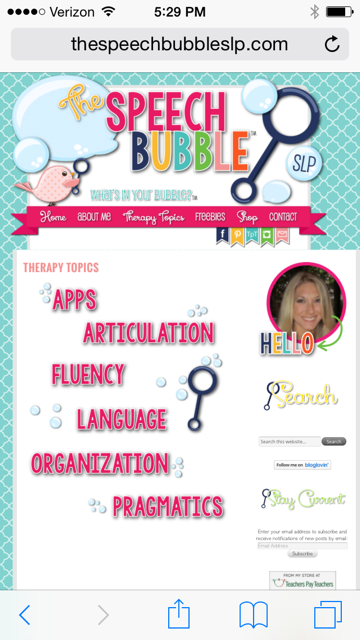 Now, all the therapy topics are in once place rather than bumping elbows and freebies have their very own link! The ‘Therapy Topics’ tab will open to its own page with the topic areas nice and big. This means it will be a lot easier to check things out on your mobile device! Same great blog, fun new look! Thank you to everyone who voted and helped be choose the looks and colors, you guys are awesome! 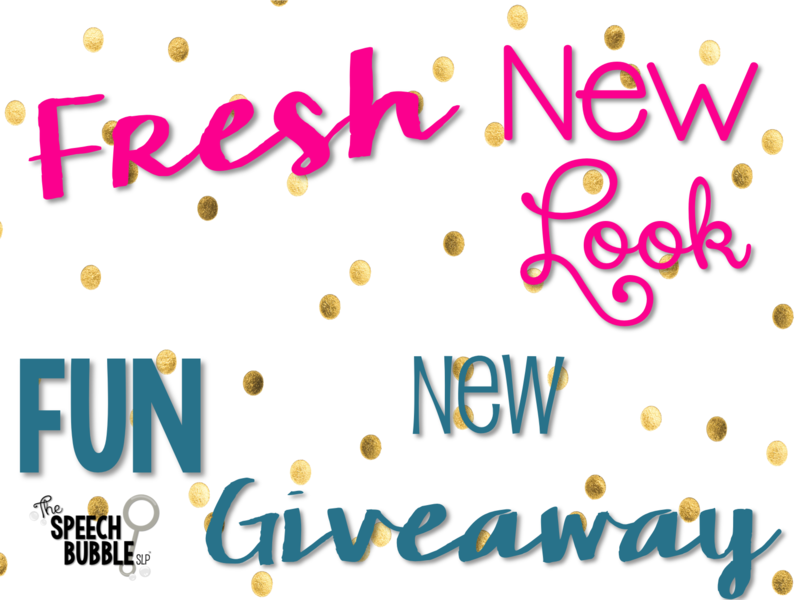 To celebrate I am have a giving away some pretty awesome prizes if I do say so myself. 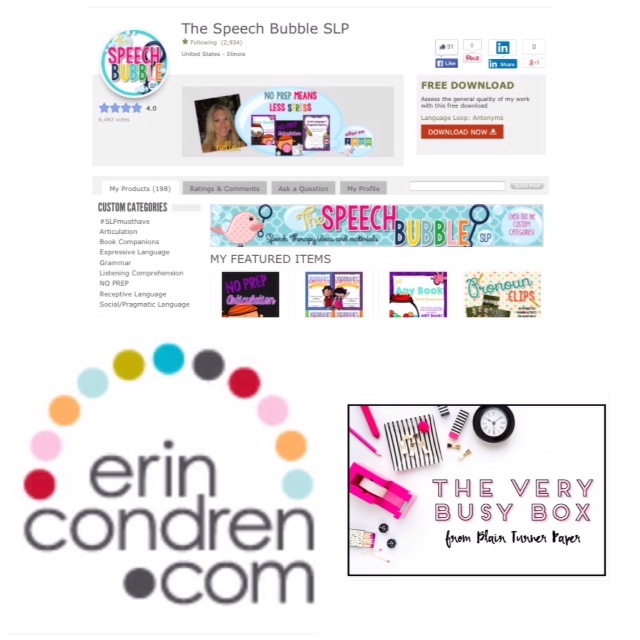 Enter below for your chance to win a ( 1st prize ) Very Busy Box from Blair Turner, ( 2nd prize ) a $20 Erin Condren gift card, or ( 3rd prize ) 3 materials of your choice from my Teachers pay Teachers store! I want to say thank you to all of you for taking time out of your day to stop by my blog, Facebook, Instagram, and Pinterest pages. You make my job even more fun and continue to challenge me to grow as a person and professional. I know sometimes we read these words and think, ‘Yea, yea. You’re just saying that because it sounds good’. I truly mean these words and hope that you know that. So once again, THANK YOU! « Board Games are Back! Cute logo and nicely organized! I like how colorful and bright the new look is. It’s also easy to navigate. Bright and fresh makeover without losing catchy theme! Very clean appearance and the bubbles are adorable! I like the updated colors, it looks a lot brighter! The banner at the top makes it easy to navigate too! Love the colors and the birdie is adorable. Great job! Love the bright colors and easy navigation! Super happy to see Bubbles made the cut! Love the color/design and how easy it is to find posts by topic! Love the new look!! Thanks for the chance to win one of the giveaways!! Love the new bright colors and graphics…looks like a winner! Bright fresh look! Nice improvement Well done! I love the colors and the little bird is too cute! Love the banner and the pretty background!!! I love the colors and the graphics. Too cute! Love the new look– so colorful and cheery! Looks clean, neat and organized! I love the colors!! Also love the organization! Love the bright colors & the birdie makeover! I will look into that, thank you! I like the bright colors and LOVE the bubbles! 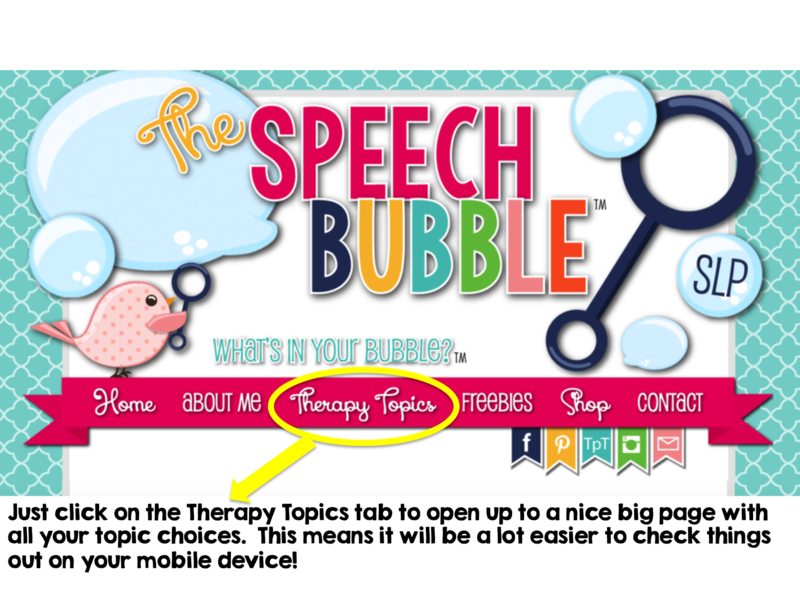 I love the bright colors and that all the therapy materials are easy to find! The new layout looks fabulous and vibrant! Love the fresh, new colors and theme! Love it the new look! Very cute and bright! The page doesn’t seem to be loading properly…everything is shifted right despite multiple refreshes, but otherwise it looks great! I look into that, thanks! I love the bolder colors and fresher look! Bright and engaging! Love the graphics! Love the new look! Very bright and colorful just in time for summer! I love the bright colors. It looks very organized and easy to find information that you are looking for. I love your new look! Great update! Love the new header and especially love the fonts!!! I love the bright colors and the pattern! It is absolutely cute!! I need you to come on over and design my blog update!! It looks perfect and with lots of color. Great job!! Love the new look and the layout! I’m loving the bright, fun colors! Looks great! I love the bright colors and organization! Great job! I love your new look and look forward to seeing your new ideas! Looks great! Love the color scheme and visuals! Looks more mature and fun! It definitely draws attention as well as the wealth of knowledge the site has to offer! 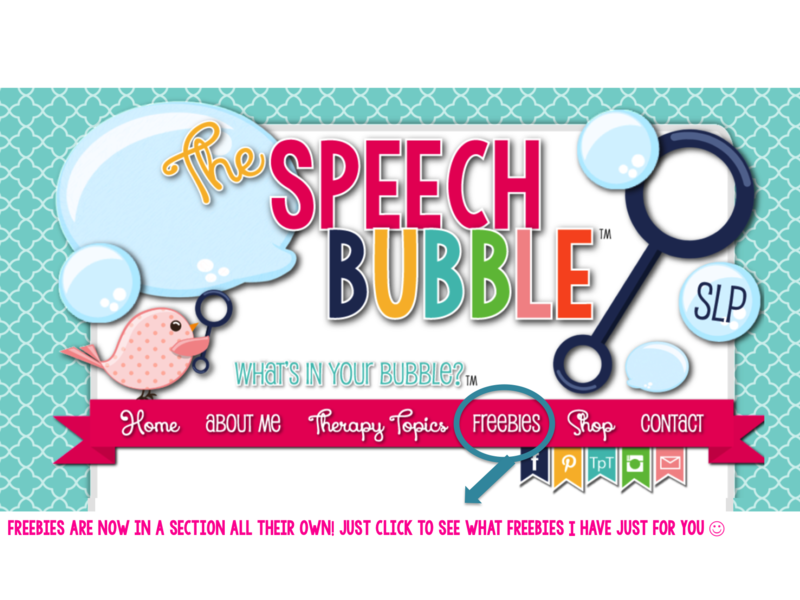 I love the bird, bubbles, bright colors…all of it! Love the fun new look! The new site is so bright and cheery. I love the new organizational pattern as well!